David - YES the 111R is in fact for sale although not advertised yet....it is booked in for a front clam respray to get rid of the stone chips etc then it will be advertised after Easter, when I get back from hols - pm me if you are interested, it had new shocks all round pre-winter. so we all should buy a 911 then ? Lee, Like many I have watched your thread with sadness over the last week. My deepest condolences and stay strong for yourself and the girls. we are an LLP, so we are Partners (Members) and yes VAT registered. if we lease a car through the business, we can claim back 50% of the vat anyway, the rest of the costs (lease and remaining vat) are tax deductible subject to the total amount being reduced by 15% if the car is over the set emissions figure (which our chosen cars will be) and deducted by an appropriate % based on how much personal use we use (likely around 15-20%). We have deceived to lease a couple of cars via our Company (an LLP). due to apparent tax benefits for the partners. likely a Range Rover sport plus either a discovery sport or a Macan. 3 year lease ideally and happy to pay a hefty intial payment with circa 12k miles pa does anyone have any experience of leasing cars through a company / things to look out for ? Can you recommend any leasing companys to try or ones to avoid any help much appreciated to prevent potential schoolboy errors. Agree 100%. Took my new 111r out for a blast at the weekend. It has possibly taken over the mantle as my favourite car ever. The rush when it opens up at high revs is addictive. Evora gone, wtf have i done! My man maths is simple - i like to buy cash not credit. ideally my target is under £50k but could go to £55k for the right car. 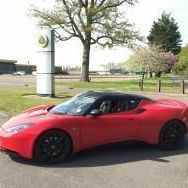 Yes i sound perfect for a 50/50 interest free deal but i bought my original LE Evora from new so i have done the new car thing once and I am now quite happy with something a couple of years old or more. I want some thing a little unusual and good to drive; doesn't have to be the fastest thing on the road just good handling. Evora is still the perfect choice on this criteria but having been in a mates Exige 350Sport recently that has to be the best option for a pure toy at this price point. With the target budget, this leaves me clearly in a 13-14 plate Evora S (ie same as the last one but a Manual) or 15-16 plate Exige (poss a 350) and with some money left over. I would probably stretch to £55k for a 400 but above that the alternatives start to open up a bit more, for example. under £50k: 10 plate AM Vantage 09/10 plate R8 V8 wild card 15 plate F Type S are very low £40's these days (i know this is not really comparable to an Evora but for 12-18 months ownership might just be an option). However in the £55-60k bracket this then opens up to: 13-14 plate AM Vantage R8 V10 (albeit an early 10 plate) Stretch to £70k and you can have an 15/16 plate Merc AMG GT.....probably a bit marmite but personally i think they look awesome and still quite rare Note lack of Porkers mentioned but you can have one at any price cant you. I am tempted by a 911 for a year or two simply because of the back seats (have 2 kids under 7) but it really is a last choice. Great cars but just a bit too many of them on the road to feel special. Maserati ruled out as they are only in auto. Any other inspirational ideas welcomed eg - BMW i8 - anyone tried one? No need for GTR playstation suggestions thanks.